One thing that I got more and more excited about as we got closer and closer to the Microsoft Build 2017 developers conference was finally learning about the new Acer Windows Mixed Reality head-mounted displays (HMD). Brandon Bray, Principal Group Program Manager at Microsoft, had teased us a few weeks earlier at the Vision Summit event in Los Angeles, California, and said there would be a lot more information at Build. Fortunately for us, he was right. The first day's keynote was not particularly exciting in regards to mixed reality. There were definitely some cool announcements, just not in our space. And, of course, mixed reality was the very reason I was there to begin with. 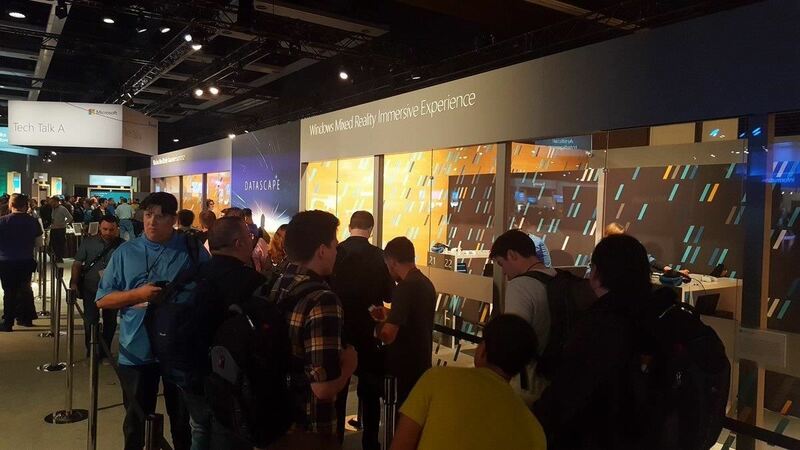 But after the keynote and the shuffle of figuring out where everything was, I made it to the expo and found myself standing in line for an experience called Datascape. 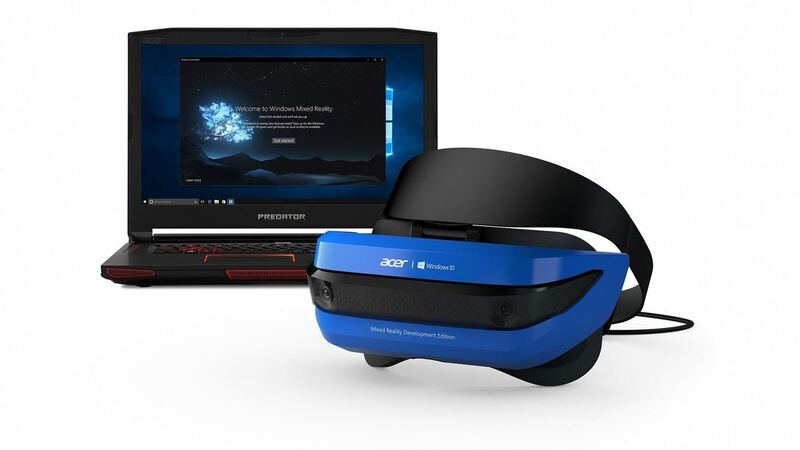 After a brief introduction to the hardware and the flow of the experience, the group I was with were walked into a room with a bunch of the new Acer Windows Mixed Reality Developers kits, Xbox controllers, and ear buds. Finally, I would not only get to see this elusive head-worn display — I would get to actually use it. Upon the first inspection and handling of the device, it is very notably lightweight — 350 grams, to be exact. The headset is a visor with a single strap to go around your head. Considering how little there is in regards to keeping the device on your head, it sat rather comfortably and was easily adjusted. The weight of the device will allow developers and users alike to use this device for long periods of time, which is really a big feature of the product. Of course, there is a possible downside to it, too — lightweight products tend to feel cheap to the average consumer. It is something we have been taught by the market. This is a problem with perception and expectations that likely won't change until more types of head-mounted displays show up. The HTC Vive or the HoloLens both feel like solid devices, and when you wear them for any length of time you neck will hurt. There is always a tradeoff, right? This device has one of the coolest features — a feature that I think all head-worn computers and computer peripherals will eventually need, especially devices with developers in mind — a front-hinged flip visor. The ability to pop in and out of the experience as you test and change things quickly and easily will speed up iteration time and lighten the fatigue that goes along with pulling headsets on and off. 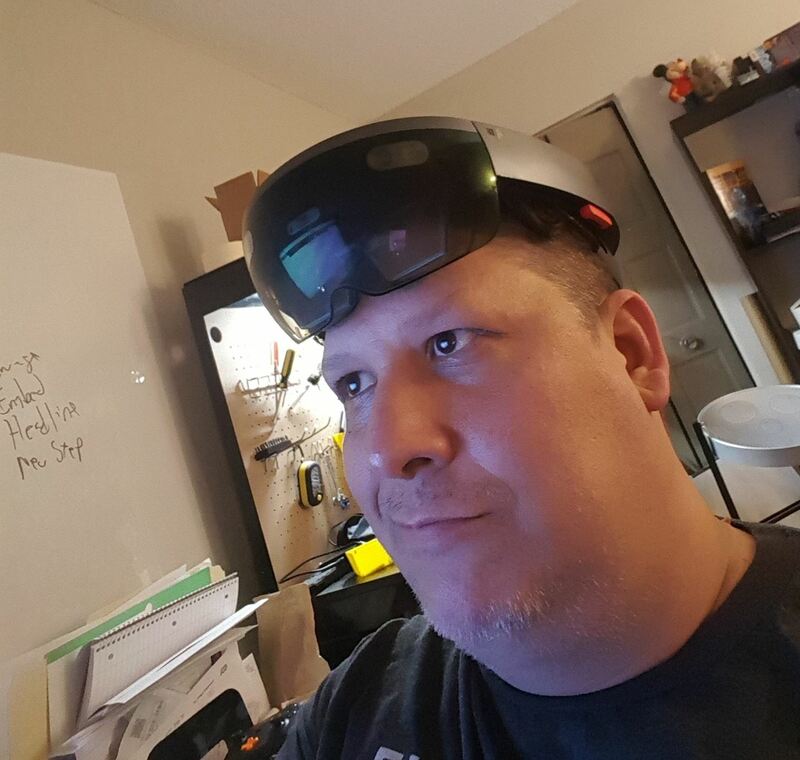 Or you could always do what I do when I am working on HoloLens applications (see picture below). The Acer HMD offers two 1,440 x 1,440 LCD displays. With a native refresh rate of up to 90 Hz, the image quality and clarity was great with zero noticeable screen door effect ... at least, when I was not having issues with the headset itself. A potential problem with the Acer headset that I ran into personally is that it has fixed, or non-adjustable, Fresnel lenses. How this affected me was that, at times, I would have a very distorted image coming through. Between that and the issue with the cotton and paper shield we had to wear to keep the devices clean, getting a good image for more than a minute was work. Eventually, I figured out pushing the device down and against my face helped alleviate the distortion. If you run into problems like the ones I did, the very feature that helps this product differentiate itself from other headsets — the front-hinged flip up visor — could be the very feature that kept it from working well for me. In addition, it appears the issues I ran into are known issues and are being addressed. Talking with some of the others that had a chance to try it, only a few ran into similar problems as I did. Bryan Crow, CTO of WonderHowTo, told me, "When I used it, I too had some distortion issues. I found the foam around the nose was too low. If I pushed it lower, it looked great." So a very similar experience to what I had. He continued, "I was told that this was a common problem and that the production version is going to have some tweaks to the foam to help with this." For the vast majority of people, this will not be a problem. And even if, like me, you have a big head with oddly offset eyes, Microsoft has worked with a number of OEM partners to have a full lineup of device options this year, each one with different price points and features. The Acer is just the first and least expensive of the announced products coming in at $299.99. I was able to try 3Glasses Windows Mixed Reality offering as well, and while I did not like having a sensor for the controllers, the picture was adjustable and looked really great. Issues aside, I did have a really good experience with the Acer headset later in the Windows Mixed Reality Academy, which — it should be noted — I was not forced to wear the cleaning aid. The experience itself was an application called Datascape. To break it down simply, Datascape was a weather simulation that allowed you to look at cloud formations, wind flow, and other details with the promise of allowing energy development teams to find spots for wind turbines and solar panels. The wind flow data could inform the placement of the turbines and would allow the user to see different metrics of the area to determine its efficiency level. Cloud formation data similarly could allow a similar placement of solar panels with the ability to predict the amount of power generated in an area. So if you are not playing a real-time strategy game, why is this useful? Because all of the data used was real data. Having real data to work with could allow some honest results in determining the usefulness of placing alternative power options in certain areas. I found this use of the technology to be a really inspirational take on the questions I constantly ask myself as a developer. How do I make sure this experience is more than a novelty? The answer I have come to is that most any single application will likely be just that, a novelty. In my mind, no single use-case wins the public over to these devices in the way many of us currently foresee. The answer will lie in the place where different applications and use-cases are both using and generating data in concert with each other. If you have any interest in watching a presentation from Build 2017 about Datascape, make sure and check out Channel 9. Overall, my experience with the Acer Windows Mixed Reality headset and Datascape was good. Issues with the device aside, the vision I saw through the application had me a bit giddy. The use-case they presented was something that has real-world implications right now. I really look forward to seeing what the team that developed this software will do with it.